A team of Middlesex University students has helped rebuild a school and climbed Africa's highest mountain, Kilimanjaro, in "once-in-a-lifetime" trip. 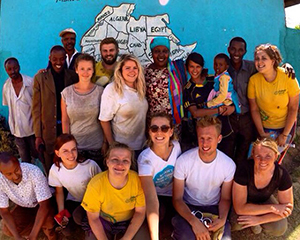 During August a team of students from Middlesex University helped rebuild a school in rural Tanzania - and raised over £24,000 for the FutureSense Foundation, a charity that tackles child welfare and education issues globally. The trip, organised by Middlesex University Students' Union (MDXSU) Raise and Give, involved ten students who had each fundraised at least £2,750. The students who participated studied a wide range of courses, from Policing, Dance and Social Work to Biomedical Science and Fashion Communications & Styling. 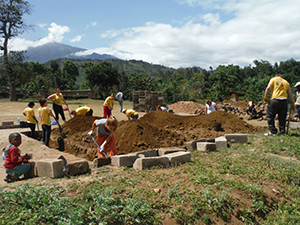 For the first two weeks they built the foundations of a new kitchen block for Englanget Primary School in Arusha, Tanzania. And during the last week of the trip, the ten students took on the challenge of climbing Kilimanjaro - the tallest mountain in Africa. While working at the school, the team stayed in a small rural village called Sekai, in a volunteer house. The school was founded by Anna Molai, of the Maasai tribe. Growing up Anna saw how her disabled peers were abandoned by their local community; so after training as a nurse she set up the school, which has one classroom specifically for disabled children. "It is hugely under-resourced - but despite this, the teachers are really passionate and do a fantastic job, and the children are so eager to learn and so happy!" "One child who suffers from cerebral palsy needed walking aids, and the teachers made them out of sticks. It was amazing to see what they did with the little they had." "The work Anna Molai did was truly inspirational. If she can achieve so much on her own, it really makes me wonder how much we can change here." Sophie, who lives in Hendon but is originally from Nottingham, helped set up the Middlesex RAG society three years ago. Since then it has developed student volunteering opportunities and connections with charities all over the world. "The trip really was a once-in-a-lifetime experience; we went through a complete mix of emotions, from the sheer pride felt by seeing a building project develop day to day, to that felt at the top of Kilimanjaro where you go through everything from feeling utterly exhausted to complete euphoria. I couldn't recommend the whole experience more." Middlesex University recently hosted the FutureSense Foundation's international development conference on campus, which saw 70 students from across the UK visit the university to learn more about the international trips the Foundation offers.